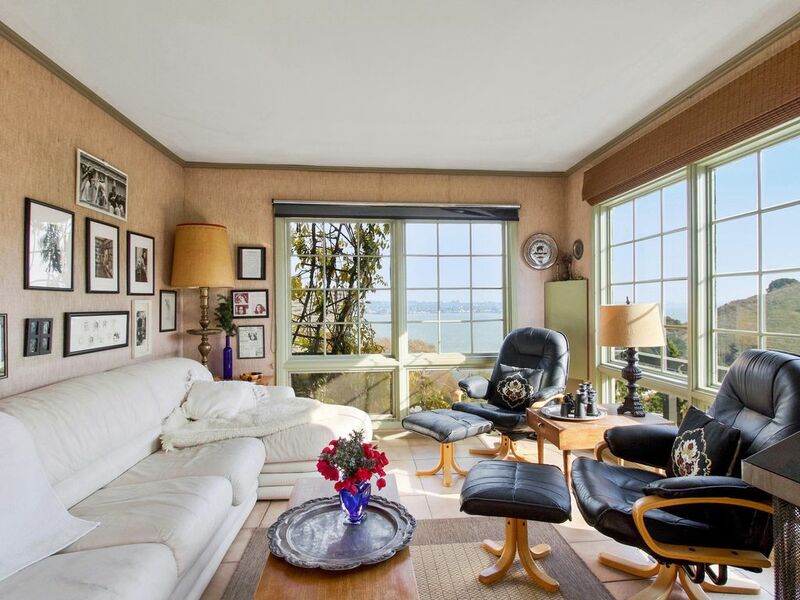 Relaxed, well kept up, charming turn-of-the-century home on a hilltop above the SF Bay at The Carquinez Straits. Master bedroom has fine Lux Queen bed and an Englander Double in the Middle bedroom. The pull-out daybed in parlor sleeps two plus a large soft Italian leather couch in the large sun room has been a favorite extra spot to sleep, where you wake to views of passing, sailboats, tugs & great ships on SF Bay, along with the rolling California hills. Clean, comfortable, quiet, convenient house with wooden decks, BBQ & multi-level deck & gardens, bordered by Regional Parkland. Fully equipped bright, airy kitchen with breakfast table. Shower over tub & new plumbing in tiled bathroom off middle bedroom and sunroom.. Sunny washer dryer laundry room with ironing board. Nice china and cookware and plenty of glassware. SF 38 miles by car on Hwy 80 to the heart of downtown SF or a fun 1 hr. Ferry ride to Fisherman's Wharf. It is 23.2 miles to downtown Napa & Wine Country tours. John Muir mansion & Jack London's cabin in Oakland at jack London Square both a 20 minute ride depending on commute traffic. Redwoods 1 hour. the drive is 2-3 hours on Pacific coast Hwy to Carmel, Monterey Bay & Hearst Castle. Port Costa is SF East Bay’s secret get away: 50 homes, population of 190, boasts 2 unique Barbary Coast style restaurant/ bars and the old time Burlington Hotel on the Straits has been refurbished, including a charming weekend coffee house , right across from the quaint post office with a view of the water. .The fashionable Bull Valley Roadhouse is open Thursday– Sunday for dinner. Wonderful Honey House coffee shop open weekends at the corner of the Burlington Hotel across Canyon Lake drive from the Warehouse Cafe, famous for the giant polar bear in a glass cage by the pool table in the bar. Plentiful reasonable food served at the Warehouse Cage with a menu of hundreds of beers. Great blues, rock and country music most summer weekends.Our historic restored and repurposed Port Costa school hosts social, art, car & bicycle club events, and is preserved and maintained by the Port Costa Conservation Society. Short bike ride or drive to fish at Eckley Pier (no license required), picnic & hike: secluded Coastline Park. Crockett Hills Regional Park's covers 2000 acres. Experience John Muir historic mansion & farm. This National park is 10 miles away, off Hwy 4: Alhambra Ave in Martinez. What else is near by: Tennis courts and public pool in Crockett 3 miles from Port Costa along the Carquinez Scenic Drive: Three miles to Hwy 80 entrance then 29 miles on 80 to downtown San Francisco. Or forget parking and traffic and get to SF via Ferry: Cross Zampa bridge to Vallejo Terminal and catch a one hour Ferry ride to Pier 39 and Fisherman's Wharf . Ride is a great tour the bay &. Bay Area Rapid Transit parking 15 to 20 minutes from Port Costa dependingon whcih station you choose. Marine World, 20 minutes. Oakland International Airport, 34 miles, 40 miles to SFO and downtown Napa is 20 miles. Situated along the bay trail coastline in between California Regional Parks, this property has acres of open space between its upper garden and the lower edge of the East Bay Regional Park trail. Hike directly up and take a walk above an unforgettable stretch of San Francisco bay coastline. The official park entrance is along the winding Carquinez Scenic Drive on your way into Port Costa. Landing area leads down to Eckley Pier for another gem of a coastline park at water’s edge for fishing (no license required) and picnics and hiking. Bird life abounds with red wing black birds, humming birds, finches, mockingbirds, kestrel, and a pair of golden eagles & offspring often fly above the house in Port Costa. Crockett Hills Regional Park is the second park just 3 miles away along Carquinez Scenic drive and it offers mountain bike trails, horseback riding and organized treks to reach the summits where, on a clear day, you can see the entire SF Bay and across San Pablo bay to Mount Tamalpais, above Mill Valley. The romantic, more upscale eating experience is Bull Valley Roadhouse new owners from SF. Nice decor. Have a drink, sitting at the bar, a tourist attraction in itself, with Tiffany lamps, brought down from the Gold Rush country, by the original owners, Port Costa house owner’s uncle and grandmother- perfect for the early California Barbary Coast decor. Open for dinner Wed - Sunday. Warehouse Cafe as described earlier is much more blue collar and attracts weekend motorcycle clubs who love the beer menu and cheap surf and turf. Locals often frequent it for the live weekend music. Weekends have great coffee and breakfast at Honeyhouse Cafe , corner of the old Burlington Hotel on Canyon Lake Drive acrsoss from the Warehouse at the waterfront. Drive 3 miles to Crockett & discover: Nantucket, on Port Street local seafood and drinks favorite, on the water by the fishing boats and the pier. The Dead Fish, on San Pablo Avenue (at Pomona Street at freeway ramp from Hwy 80) is an upscale SF chain for glitzy cocktails & fish dinners with bay, Zampa Bridge & Naval Academy water views. From Port Costa it is one hour and 34 minutes or 75 miles to Armstrong Redwoods State Natural Reserve, located in a canyon two miles north of the Russian River, in Sonoma county just north of Guerneville. Lots of good wineries and places to eat in the area. The Coast Redwood Sequoia sempervirens grows along the CA coast all the way up into southern Oregon in an area about 500 miles long by 30 miles wide. Further north Montgomery State Reserve redwood trees is 104.3 miles from our house and 13 miles west of Ukiah, CA Ukiah, 2 hours 33 minutes from Port Costa house, according to google. One tree growing there is the tallest known tree in the World according to Trip Advisor. Pack a good picnic and beverages as you wont want to take time to hunt up a place to eat. It is a much longer drive up to Avenue of the Giants, the most famous area of giant redwoods: 4 hours drive up and back to Humbolt Redwoods state park : 218 miles via east 80 and CA 37 toward Napa. At Lakeville Hwy you turn onto US 101 ramp and go north for 177 miles till CA 254 N and 2 miles further on to Humbolt Redwoods State Park. Port Costa has an annual July 4 parade. Sonny and I outfitted our old Mercedes with my late great aunt Mimi's monkey doll collection and won first place. Mimi Paul's Popouri was the 1st antique store in town in the early 1960s. I've been executive director for LITA of Contra Costa since 2002. Terrace gardening is my passion. Fortunate, as my house is on top of a hill. My parents purchased the Port Costa house as their first home in 1963 after completing a lifetime of traveling to different countries with my Dad's outfit, Utah International Mining and Construction. In those days Port Costa was a thriving antique center, connected by Carquinez Scenic Drive to Martinez, the county seat. A storm washed out the road near Martinez in the 1970's keeping Port Costa at a very small population of 180 inhabitants, which is how most folks in town like it. My brother and I wanted to continue our folks' favorite retirement occupation: having guests stay over to enjoy the home they both loved so much. My younger brother lives in Los Angeles but visits often. My partner of 36 years now, Sonny, and I live in an apartment below the main house which my Dad built for my grandmother and later served to accommodate any extra guests. There is a connecting interior spiral staircase which leads down our pantry and laundry room. A sturdy oak door at the foot of the stairs is for rental guests privacy. Since 2002 I have been Executive Director for LITA 'Love is The Answer' of CC which serves a growing number of convalescent and nursing hospitals around the county. We bring one on one volunteer visitors, pets, musicians, dancers, elementary and middle school groups of children to visit on a regular basis. The 80 volunteers and 30 skilled nursing facilities keep me busy. Gardening is my passion, which is a good thing since there are so many gardens on the property. Other hobby is sitting in the garden watching the sparkling water. I inherited the 'Last Resort along with my brother from my parents. The decision to make the top level a vacation rental was natural one since every guests who ever visited our family was astonished by the views, loved the house and and couldn't get over how close it was to every point of interest in the Bay area. With a bit thought on times, it is an easy ride into San Francisco, up to Bolinas or the Wine Country tours. Monterey and Carmel by the Sea are under 3 hours away ( all depending on when you drive. Yet Port Costa really feels like it is 'out in the country'. I have detailed elsewhere in property description the distance and directions to the Redwood Trees GIANT REDWOODS From Port Costa it is one hour and 34 minutes or 75 miles to Armstrong Redwoods State Natural Reserve, located in a canyon two miles north of the Russian River, in Sonoma county just north of Guerneville. Lots of good wineries and places to eat in the area. The Coast Redwood Sequoia sempervirens grows along the CA coast all the way up into southern Oregon in an area about 500 miles long by 30 miles wide. Further north Montgomery State Reserve redwood trees is 104.3 miles from our house and 13 miles west of Ukiah, CA Ukiah, 2 hours 33 minutes from Port Costa house, according to google. One tree growing there is the tallest known tree in the World according to Trip Advisor. Pack a good picnic and beverages as you wont want to take time to hunt up a place to eat. It is a much longer drive up to Avenue of the Giants, the most famous area of giant redwoods: 4 hours drive up and back to Humbolt Redwoods state park : 218 miles via east 80 and CA 37 toward Napa. At Lakeville Hwy you turn onto US 101 ramp and go north for 177 miles till CA 254 N and 2 miles further on to Humbolt Redwoods State Park. Moon rise watching across the beautiful water from under the gazebo our on the deck on the many calm quiet nights. Year round remarkable hill and water views and migrating and local varieties of beautiful birds, wild turkey flocks and deer, Our village is full of artists and musicians, some of whom can be seen heard ( in the most pleasant and off in the distance manner) at venues downtown on a weekend night. I've been told I should take and post more pictures of the upper and lower gardens that are my greatest delight work. We will compost all your organic green kitchen waste, if you are a mind to participate in the enrichment of our very large garden. My parents were instrumental in protecting the surrouding hills and waterfront from developers until it was bought by he East Bay Regional Park . My brother and I are still great supporters of the Port Costa Conservation Society. Upper Prospect Avenue has had the same 6 houses standing since the 1890s. Our neighbors treasure the quite and the safety and stability of the street and knowing one another and looking out for each other. They are friendly and accepting of the guests who find their way to our hill top retreat. Single Victorian style bathroom has a full bathtub with overhead shower. A large vanity with modern, antique style chrome sink fixtures provides plenty of surface area, great lighting, mirrors, drawers & shelves. Black & white floor tiles match an old fashioned decor. Enjoy a new top of the line, water efficient, planet friendly Toto dual flush toilet. Sliding doors at the two exits maintain privacy for occupant of adjoining middle bedroom. Window opens onto the garden. there is a steam bent antique chair with seat cushion and an Ikea bathroom scale. Dresser contains plenty of bath, hand and face towels, a hair dryer, shower caps and one first aid drawer with band aids. Heat lamps plus panel and extra ceiling lighting make ablutions a pleasure and a breeze. Dark dresser has faux white marble slab atop and stores plenty bath and hand towels, and hairdryer .Oval mirror above dresser gives another place to put on make up. Night lights in placed strategically for safe arrivals. Honeyhouse weekend coffee spot plus Two busy restaurants open Thurs - Sunday., Bull Valley Roadhouse draws SF well heeled. Bikers & locals love Warehouse Cafe 1000 beers, music & crablegs. About 50 homes, we all have boxes at the old fashioed post office downtown by the Warehouse Cafe and across from Burlington Hotel whose Honeyhouse Coffee shop & lobby are both favorites on weekends. Port Costa was a major wheat exporting port before the 1906 earthquake. No tourist development along the water, but an interesting walk is possible. Hilltop lot with decks and view windows affords spectacular views of the SF San Pablo Bay at Carquinez Straits. Ocean vessels, tugboats, sail boats glide by. Lovely views 24/7. Steps straight down a steep 2 blocks from the house take you to the water, and waterfront businesses. Ceiling fans in the common areas and area fans for each room on the few hot days each year . Breezes off the Straits and a quiet neighborhood make it fine to leave tall screened windows open. Egyptian cotton sheets, plenty of blankets, pillows comforters, all laundered and fresh for each new group of guests. Front parlor is cosy and perfect for satelite TV & Movie watching. It laso has a writing desk, Sofa ( fold out bed) and an easy chair. Sunroom seats 6 as is and 8-10 with leaf stored in the middle bedroom closet for when expansion is required for a special gathering. Peerless CD jazz collection as well as some good classical and pop classics including 2 classic 70's San Francisco Records CDs written and recorded by the owner. No lawn but plenty of garden paths for roaming. This house is all about the views so the deck and balcony are perfect for that. Near by frankilin Canyon golf course. This is my favorite VRBO I’ve ever stayed at! It had everything that we needed and the views were absolutely amazing. It was cozy and decorated to make it feel like home. I can’t say enough about how it made our vacation 10 times better to wake up and come back to such a beautiful place every day. Victoria was a perfect host. She was so generous and accommodating. I would stay here again and will recommend it to my family and friends if they ever want to visit California! This home in Port Costa was such an exciting find for us. My friend needs to come to the Bay Area every few months or so for a medical consultation, so we've booked two or three properties in the past. We've liked them all, but this one was by far our favorite. We like to plan some excursions while in the area and this was a perfect base from which to do that. Victoria made us feel so welcome in her home and was very accommodating when we needed to make a last-minute change. While there are many wonderful homes in the Bay Area, this one has warmth and character. We definitely will return in the future, as we both felt as though we'd found our home away from home. Thank you, Victoria, for sharing your beautiful home with us! Victoria's home is beautiful with stunning views. The location is great to go multiple places: we took the ferry ride to Fisherman's Wharf one day, went to Monterey Bay, Carmel and Point Lobos in a day, spent Christmas day in Chinatown and our anniversary visiting Napa & Sonoma and each day we (our daughters and my husband and I) came back to a wonderful home to relax and enjoy the view of the bay and the hills (which we climbed the trails before we left). The home allowed us to come together to play cards, watch the deer on the hills but was roomy enough so that 4 adults could have their own space, we loved the serene location and the charm of Port Costa. Victoria's recommendations were greatly appreciated. We enjoyed a great meal and drinks at the Warehouse (which we walked to from the house). Based on the all of the positive reviews that I had read before reserving the home the decision to stay here was the right one! Victoria thanks for the Christmas decorations and the lit Christmas tree on the patio. Your family was so easy to host. Thank you for taking time to write what you say was our 101st 5 star review! Do come again one day. I have stayed many times at this delightful hideaway with a wow view overlooking the Carquinez Straits. Cosy and quiet, charmingly decorated, it is a perfect spot to feel cosy and private, alone to get some work done or entertain friends. An ideal location to launch adventures in the greater Bay Area or further, in a few days I was able to make day trips to a gourmet lunch in the Napa Valley, the De Young Museum in Golden Gate Park in San Francisco, a drive in the Sacramento Delta, and Christmas shopping in the Walnut Creek/Lafayette area. Home before dark each evening, I turned on the gas heater and cooked a meal as the light faded and night fell over the greening hills. Thank you so mucj for your review. You are always welcome here and we await your next return! Great house. Would recommend to anyone, would stay again. Happy that the house & views made your work trip to bay area more of a pleasure. Port Costa is 31 miles from San Francisco across the Bay bridge (on Hwy 80 east past Berkeley.) Port Costa village is on the SF bay at San Pablo bay between Berkeley & Napa Valley and called Carquinez Straits. Public swimming pool, park & tennis courts are just 3 miles from the Port Costa house in the neighboring town of Crockett. There is a great play ground on Canyon lake Drive, the main street of Port Costa at the historic Port Costa School, now used as a Community Center. between Crockett and Port Costa is the East Bay Regional Park Landing area leading to park trails and down to the water and Eckley Pier where fishing ( without a licence) is allowed. There is also a nice level park and picnic tables there. Port Costa 23 miles from Napa, gateway to fabulous Northern California Wine Country. Take the Ferry from Vallejo, to San Francisco, a great way to see the bay and avoid traffic and parking in SF. ATT Park at SF Embarcadero for ball games & events easy by Vallejo Ferry. Terminal is just across the Zampa bridge. Port Cost Guests often drive down to Carmel and Monterey by the Sea from here and some take the 3.5 hour drive up to Lake Tahoe and state line casinos. Mendocino is a day trip. Closer to home: Sierra Club founder John Muir's home is a lovely national monument/ museum 15 minutes away. Jack London's cabin is 20 minutes away in Oakland's Jack London square.